One collectible ceramic luster heart. This assortment is sculptured and painted by hand by skilled artisans in Salem, Oregon. Each ornament is unique since as the various luster colors are applied, they flow and form a different design. 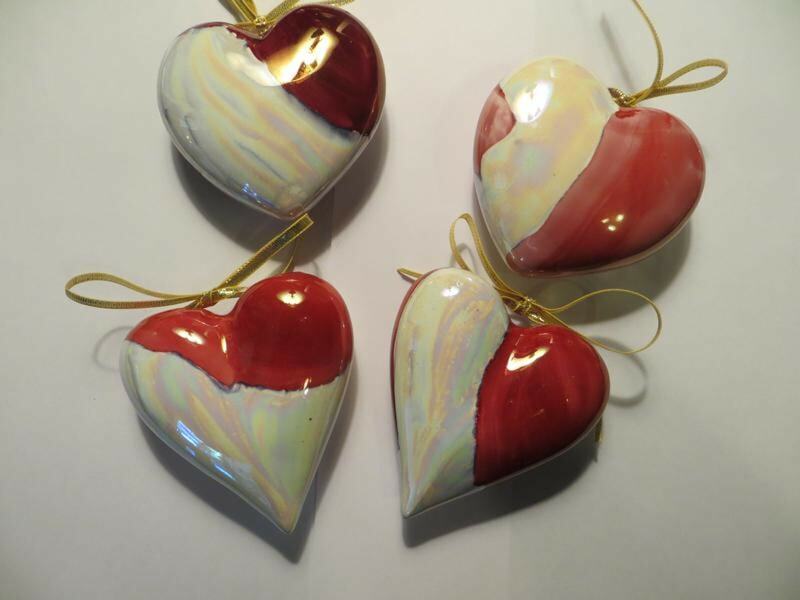 A clear glaze is then applied over top of the designs and fired at 1900 degrees. The surface is dinnerware safe, nontoxic and should be treated like any fine dinnerware. Not just for the holidays, they can be used to embellish any special occasion. Inscriptions and dates may be written in gold making them a special keepsake.Large heart is 2 3/4 to 3 inches in heigth and 3 inches wide. Made in America. Gift Boxed.